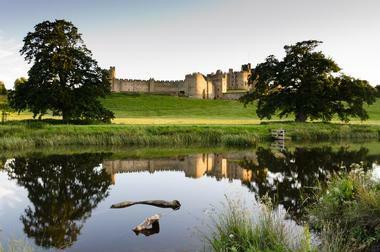 For 1,000 years a castle has been on the site where Alnwick Castle stands. The Percy family has called the castle home for the last 700 years, and Alnwick Castle today is one of the United Kingdom's largest inhabited castles. The 12th Duke and Duchess of Northumberland live inside the castle's keep today. Many of the towers serve as museums for the public; as well as used for storage, archives, and records. It's not known for certain when the first castle at this location was built. However, it's almost certain that by 1093 there was a castle where the one today stands, as it was in 1093 that King Malcolm III of Scotland tried to take a castle. The first ones to construct a stone castle were probably the de Vescy family. Wooden structures may have existed before this. Parts of this castle can still be seen today, such as the State Rooms, where the chevron patterns that are characteristically Norman can be seen, and the archway leading to the Inner Courtyard. Some of the Outer Bailey's walls date back to around the late twelfth century and are some of the oldest remaining parts of the castle. Much of the masonry of the castle, however, occurred in the 1300's during the time of the Percy Lords of Alnwick. The upper walls' battlements were built in the early 1400's by the 2nd Earl of Northumberland. Alnwick Castle's famous Octagonal Towers, located at the keep's entrance were constructed around the 14th century after the Percy family bought the castle. Thirteen stone shields can be seen on the towers, representing the different families have occupied the castle or married into the Percy line. Between the two towers, visitors can also see the Royal Arms. The castle's old drawbridge has now been replaced with a wooden walkway. A survey by George Clarkson, the surveyor of the 7th Earl of Northumberland, in 1567 provides a good idea of what the late medieval castle would have looked like. It's likely that the Barbican and its gatehouse were completed around 1475, and are an great example of military architecture of the 15th century. In the castle's keep the dungeon can be found beneath the right-hand Octagonal Tower. The castle's moat would have been filled with sharpened stakes and logs with sharp objects attached to them rather than water in order to better defend the keep. Several restorations and renovations were done by the 1st Duke and Duchess during the 18th century. Alnwick Castle had fallen into disrepair between 1670 and 1750. The Duke and Duchess returned to the castle in 1750, and began transforming the no longer used medieval garrison into an 18th century Gothic residence. During the time, the Gun Terrace was also built outside of the medieval curtain walls as a viewing area for the new landscape. The terrace is named as it is because of the canyons that are displayed there. The 4th Duke changed the castle again during the 19th century; transforming the keep's interiors to the Italian-style State Rooms that can be seen in Alnwick Castle today, re-medievalising the more Gothic features the previous Duke had constructed, and extending the castle's walls. 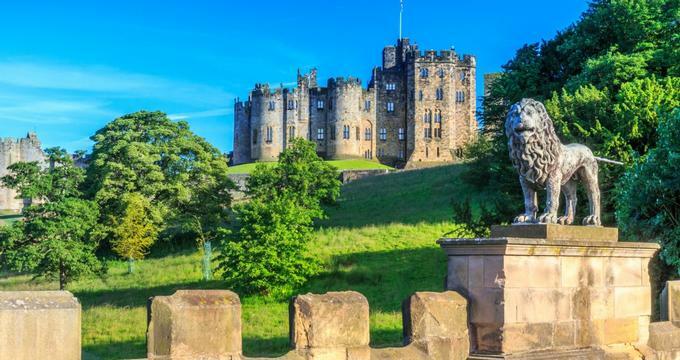 The lavish, grand State Rooms can be found inside Alnwick Castle's medieval walls, and may not be exactly what visitors expect. The 4th Duke wanted the rooms to have the aesthetics and style of the Italian Renaissance. Guests would walk through a Norman archway into a redesigned courtyard, climb the Grand Staircase, and find a luxurious palatial home instead of a stone fortress. The walls feature artwork by masters such as Titian, Turney, Tintoretto and Canaletto; as well as Italian-style silk. The ceramics and furniture in the rooms have been collected over hundreds of years by the Percy family. Modern items from the current family and temporary exhibitions can also be found in the State Rooms. One of the castle's most spectacular carved ceilings is featured in the Dining Hall, displaying the heraldy of the Percy family. The centuries of history can be felt in the State Rooms, however, these rooms also showcase Alnwick Castle as a modern family home. The State Rooms are made up of the Grand Staircase, Lower Guard Chamber, Upper Guard Chamber, Library, Ante Library, Drawing Room, Saloon, China Gallery, Dining Room, and Chapel. 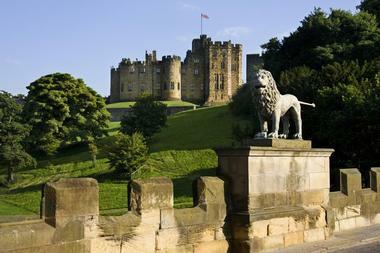 Opened in 1826, the Castle Museum at Alnwick Castle was a major part of the restorations by the 3rd Duke. The desire of the museum was to promote the study of archaeology of the North and the Duke surrounded himself with the most informed minds to accomplish this. Significant digs and investigations were undertaken with patronage from the Duke. The Postern Tower now is home to an important collection of Irish and British archaeology. The collection includes swords and a small shield recovered from the battle in which Hotspur was killed, the Battle of Shrewsbury in 1403. On display in the Italianate State Rooms of Alnwick Castle is one of the finest private collections of ceramics, furniture, and art in the country. Much of the artwork on display were brought to the castle during the 4th Duke's restorations in the mid-19th century. Artists featured in the collection include Claude Lorrain, Tintoretto, Turney, Canaletto, Titian, Dobson, and Van Dyck. There is also an extensive collection of other paintings from the Italian Renaissance and commissioned sculptures. Portraits of the Percy family members over several centuries can be found throughout the State Rooms as well. An excellent porcelain collection can also be seen in Alnwick Castle. Pieces by Derby, Minton, Frankenthal, and Sèvres are included in the collection, as well as china services from Paris, Chelsea, and Meissen. Furniture and woodwork featured in the State Rooms display unique and ornate craftsmanship. The castle's amazing wooden ceilings, window shutters, and doors were created by the Alnwick School of Carving. 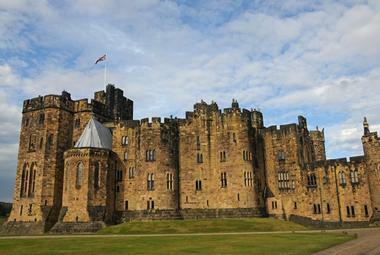 Alnwick Castle's Fusiliers Museum tells the tale of the Northumberland Fusiliers, and is located in the Abbot's Tower. This infantry regiment still holds an unbroken record of service since 1674, including combat in the American Revolutionary War, World I, and World War II. The museum features weapons, medals, uniforms, memorabilia, and painting from different historical campaigns. The personal histories and records of the Percy Tenantry Volunteers are available for visitors to discover in the Percy Tenantry Museum at Alnwick Castle. England faced a serious threat of invasion from France during the Napoleonic Wars. No other single act in the history of the Percy family shows better the interplay of events and characters, the workings of a great landed estates, and the fusing of local and national concerns than the creation in 1798 of the Percy Tenantry Volunteers to defend Alnwick from the French. The museum, found in the Constable's Tower, includes accoutrements and equipment, as well as the real-life personal stories of those involved in the group. The Coach House Exhibition at Alnwick Castle tells the story of the Percy family's luxurious state coach. In 1902, the coach was used at King Edward VII's coronation, and was restored for the current Duke's eldest daughter's wedding in 2011. The wedding dress worn by Lady Katie, the Duke's eldest daughter, is displayed in the coach house. The coach was also used in 2013 for the wedding of Lady Melissa, the Dukey's youngest daughter. Alnwick Castle's Harry Hotspur Exhibition tells the story of the most legendary medieval knight in the country and the castle's most famous son. The exhibition, located in the Constable's Tower, showcases Harry 'Hotspur' Percy's life and character. He earned the name 'Hotspur' for being a courageous and impetuous warrior, having led 900 men into battle when he was only twelve or fourteen. The exhibition features historical records, his own letters, a film that focuses on some his most famous battles. The First World War Exhibition, housed in the Edwardian Life Below Stairs area of Alnwick Castle, features stories of people who worked and lived at the castle during World War I. The exhibition explores how the war impacted Alnwick in rooms that have never been on display to the public. The Northumberland Estate Roll of Honour is displayed, and visitor can also listen to a recording of names of people who served in the war read by those who at the castle today. Within the darkness underneath the walls of Alnwick Castle are The Lost Cellars. Visitors are invited by the Keeper of the Lost Souls to journey deep in the cellars' mysteries, where the sounds of the past linger and forgotten centuries fill the air. This abandoned space has been locked and undisturbed for decades. Unique to the North of England, The Lost Cellars attraction is full of grisly folklore and tales of terrible fates, along with hair-raising lighting, the latest audio technology, and character holograms. Ther performance lasts around twenty minutes. Alnwick Castle's Knight's Quests offer visitors with a chance to experience medieval times. Participants will step back in time to 1389 as Harry Hotspur's homecoming is celebrated in the town of Alnwick. The fun includes dressing up in medieval clothes, playing traditional games in the square, becoming an artisan apprentice in the marketplace, and practicing knightly skills in the lists.